This El Niño year has been dumping rain and snow on California’s Sierra Nevada mountains. But water managers don’t just eyeball how much snow they think is up there, tucked away in those high mountain basins. Snow inventories these days are high tech, involving airplanes and lasers. Tom Painter of NASA’s Jet Propulsion Lab and Caltech joins Ira to explain. Want to learn more about surveying snowpack? 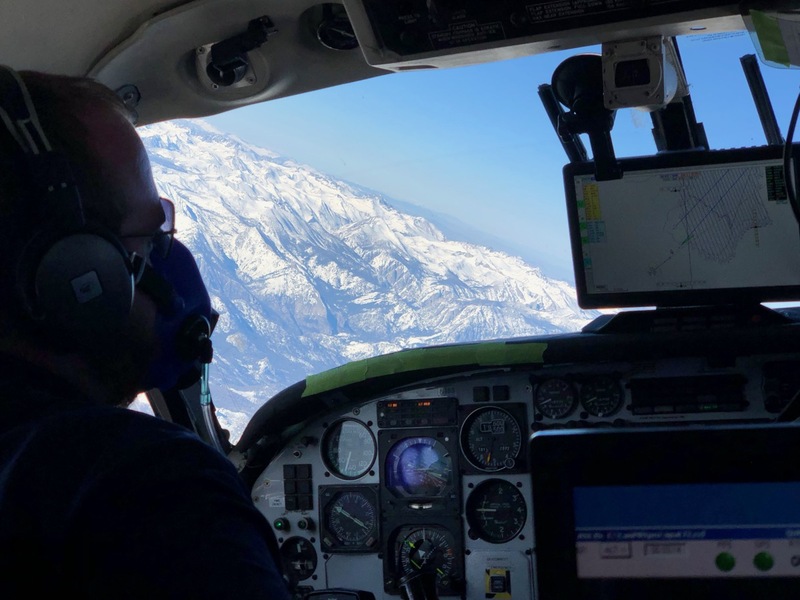 Watch a Science Friday Macroscope video about forecasting the meltdown, and check out the view from a plane about the Sierra Nevada mountains below. Take a look at a map of this year’s snowpack survey flight maps. Watch the Airborne Snow Observatory in action and learn how researchers forecast snowpack meltdown in a Science Friday Macroscope video. 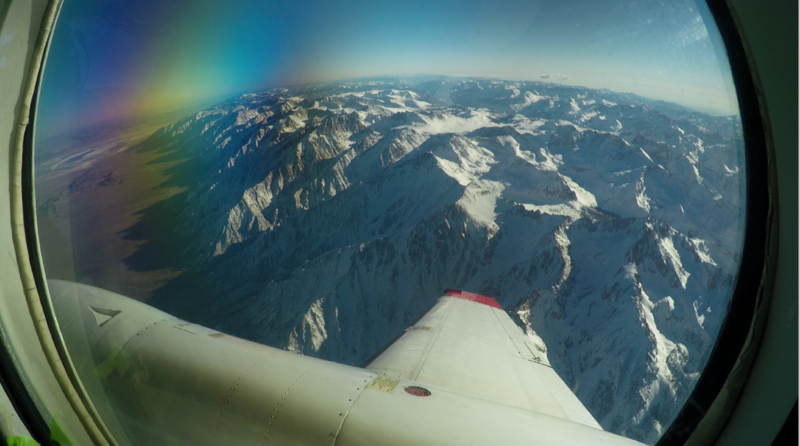 Learn more about previous methods of measuring snowpack with airborne lasers and radar. Tom Painter is principal investigator for the Airborne Snow Observatory at Jet Propulsion Laboratory in Pasadena, California. IRA FLATOW: As we heard in that piece, this El Nino year has been dumping rain and snow on the west. That’s adding up to a bumper year for the white stuff. Enough that people will be able to ski down California’s Mammoth Mountain until at least the 4th of July. All that snow pack is a good thing for California and the Western US, but water managers don’t just eyeball how much snow they think is up there tucked away in the mountains. Snow inventories these days are high tech, involving airplanes and lasers. Joining me now on this World Water Day to explain is Tom Painter, principal scientist at NASA’s Jet Propulsion Laboratory at Caltech. He joins us from Mammoth Lakes, California. Welcome, nice to have you back. TOM PAINTER: Thanks, Ira. It’s good to be on. IRA FLATOW: Nice to have you. Tom, you’ve been up there flying over the mountains. What are you seeing? Is it good news or bad news about the snowpack this year? TOM PAINTER: The team has been flying, and it’s definitely good news. And as was mentioned earlier, last year wasn’t really a great year. It was about 65 percent of normal. This year we’re more than doubled that and have been trying to catch up with the big “snow-pocalypse” that we had two years ago when I was last on. And one of the great things that we’re seeing this year though, is that in the lower elevations of these mountain basins, there’s still a lot of snow. We’ve had a relatively cold year compared to the last 10 years, and so we’re keeping that accumulation of snow. The nice thing about that, not only in that there’s more elevation bands with snow, but there’s more surface area at those lower elevations. And so that means that much more water accumulating this year. So it’s a good message that we’re seeing out there right now. IRA FLATOW: Give us a quick snapshot of how your system works. You fly over shooting lasers at the snow, right? TOM PAINTER: That’s right. That’s right. So there are two lasers that are looking– one looking out slightly forward and one slightly backwards. We fly on a plane at about 20,000 feet and measure how far away the snowpack is. We do that also when there’s no snow on the ground. And the difference between those two is the snow depth. And it’s a bit more complicated than just subtraction. We also have to deal with passing through the trees. And then we have to bring in information about the snow density– how dense is it? Is it really dense, or is it really light snow? And that controls then how much a certain amount of depth turns into a layer of water. IRA FLATOW: Can you give me an idea of the range of the snowpack? How tall in some places? How deep? TOM PAINTER: So in 2017 it was a huge year. And there were places in the Sierra where we were finding snow that had fallen and then been redistributed through either wind or avalanching to depths greater than 100 feet. This year we’re looking at about 60 to 70 feet as our deepest depths so far. But again, compared to 2017, which was a huge year for accumulation, the lower elevations down to around 5,000, 6,000 feet are seeing quite a bit of snow depth that had– in 2017 there was no snow down there. So we’ve got a more level snowpack across the Sierra right now. And from a water management standpoint, that’s really important and really helpful, because it’s a far more predictable snowpack going forward, and a snowmelt release coming out of the mountain. IRA FLATOW: That’s what I was going to ask you next. Will this help recharge the aquifers out there from that long drought that California has had? TOM PAINTER: Absolutely. Having these big years is great for refilling the reservoirs, and likewise refilling the aquifers that were depleted greatly during the intense drought. And that works in different layers, either through the natural process of the recharge coming off of the mountains, from the mountain block itself, or many of the water management entities now are working on processes to recharge– taking some of the extra water that would otherwise head out into the ocean and putting it out on the fields for recharge. So not only are we seeing these improvements in the technology of measuring the snowpack, but we’re also starting to see these improvements in our ability to recharge our aquifers. IRA FLATOW: We’ve seen, I’m sure you have also, this massive flooding out in the Midwest this week. And it’s just unprecedented, so the climate change is just causing crazy things. Some of that is due to rapid snowfall and rapid snow melt. What’s your take on that and how that might affect– how snow melt affects flooding? TOM PAINTER: Yes. So that out on that landscape of the Upper Midwest, there was quite a bit of snow distributed out across the Dakotas and Nebraska, Colorado, Kansas, and then the sudden rains that came on top of that. If you think about the way this works, the snow is precipitation falling out of the sky, except that it sits there and doesn’t run off immediately. So it’s like you have a reservoir well sitting there out on the landscape. And when you get heavy rains, high temperatures, lots of water vapor interacting with that snow, it then liberates that water. And so that reservoir is suddenly opened up, and it’s almost like a dam breaking. And that’s why you see such intense flooding out across the landscape. IRA FLATOW: — I’m sorry. I was going to jump in with a break. OK. That’s one of the big what? TOM PAINTER: That’s one of the big reasons we’re so worried about climate change, is these rain onto snow events going forward. IRA FLATOW: I’m Ira Flatow. This is Science Friday from WNYC Studios, talking with Tom Painter, principal scientist at NASA’s JPL at Caltech. Of course, some of the problems with the Midwest that you don’t have, or maybe you do, certainly not out in the plains, the valley of California, is you have this water on top of frozen ground that’s been frozen all winter, right? It’s got no place to go except rush away. TOM PAINTER: That’s right. And although the soils up here, they do tend to dry out in the fall, and so you can get percolation of that water into the groundwater. Really one of the big concerns for us when we have big snow packs like this is a rain on snow event, just like what happened in the Midwest, and that convergence of all that water down the steep canyons coming off the Sierra and out into the Central Valley of California and many of the cities that are not as well protected as they could be. And so having that understanding of snowpack and the processes going forward is really critical to protect our infrastructure, protect our water resources, and in general to stay safe. IRA FLATOW: So is that something you’d be looking out for, is the threat of a big rainstorm coming through and melting a lot of the snowpack? TOM PAINTER: Yeah. Either rainstorms falling out onto this large snowpack or intense melt periods. So the skies clearing and temperatures being higher, and so all of these energy inputs going into the snowpack to melt it very rapidly. Now fortunately, this has been a colder than average year. And so when the snow falls out of the sky, it falls at a lower temperature. And so it takes that much more energy to warm that snowpack up to where it is in a place of melting. But even then, if we get rain on snow even at the top surface, that can create a substantial snowmelt pulse and flooding potential. IRA FLATOW: Is climate change making it more difficult to predict what happens to the snow and whether it can feed the summertime– the water that you need? TOM PAINTER: It absolutely is. So the way that the water management and stream flow forecasting has been carried out over the decades, is with averages across say 20 years and relationships built around that. But as the climate has been changing– so temperatures have been increasing and there have been more extremes in dry to wet. Those relationships that those predictions of stream flow had been built around have become less reliable. And that’s why these new technologies that we’ve implemented have become that much more relevant and important to being able to understand snowpack. So instead of averaging a good forecast across a decade, we want every year to have an excellent forecast. We don’t want to just have to be able to average to across 10 years, we do pretty well in the average year. We want to do well in every year. IRA FLATOW: Tom Painter, principal scientist at NASA’s JPL at Caltech. Thank you for joining me today. IRA FLATOW: You’re welcome. Now we have great photos and videos of these snow surveys high above the Sierra Nevada up at ScienceFriday.com/snowpack. And one last note for all you New York area listeners, we’re bringing Science Friday to BAM in Brooklyn for a live show with topics tailor made for you New Yorkers, like the secret lives of city pigeons, and how you can help artificial intelligence decode the sounds of New York City. Plus a live band, all kinds of surprises. That’s Saturday night, April 27. Saturday night, April 27. Tickets and info at ScienceFriday.com/Brooklyn. Hope to see you Saturday night, April 27. Charles Bergquist is our director. Our senior producer, Christopher Intagliata. Our producers are Alexa Lim, Christie Taylor, and Katie Feather. Special thanks to our digital producer Johanna Mayer for helping us put together our packages this week on the snow pack and the super bloom. You can see both at ScienceFriday.com. Of course, technical and engineering help every week from Rich Kim, Sara Fishman and Kevin Wolfe. You can email us, if you’d like, to scifri@ScienceFriday.com. All kinds of good stuff up on our website. I’m Ira Flatow in New York.